With a little bit of clever planning, after a Saturday night party into the early hours of the morning celebrating a friends 40th birthday, a hike ranked “easy” was chosen for our last hike. One too that would allow a tiny little bit of a lie in on Sunday morning, every aware of the looming hangover that might be present! The start of the hike ~ I was ready to face whatever lay ahead. 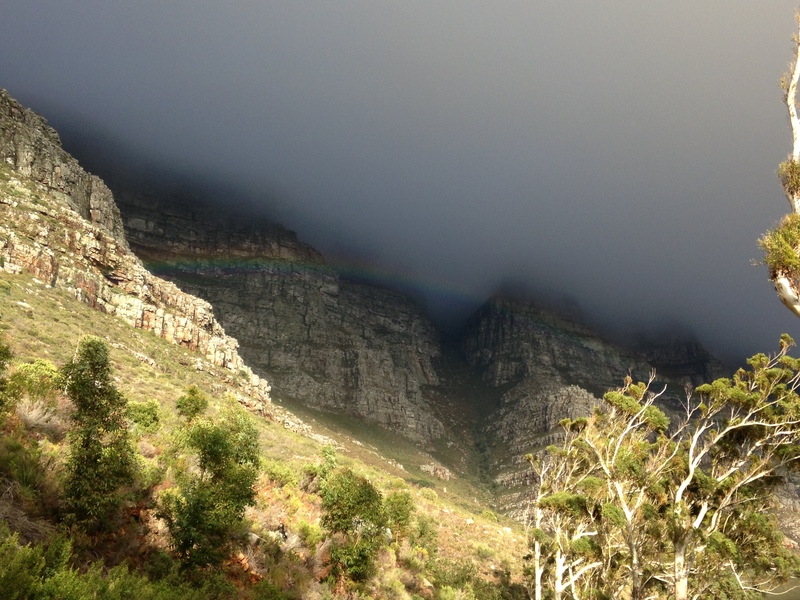 As we parked and climbed out of our car this beautiful rainbow appeared across the front face of the mountain. The usual hiking suspects met at 9am, ok slightly later for some of us given the circumstances. Upon arrival one member was already on the mountain, thinking he was late and we were already on the mountain he headed up to see if he could catch up to us. Luckily he saw us down below from the slopes up above and messaged me to say he would wait up there for us. 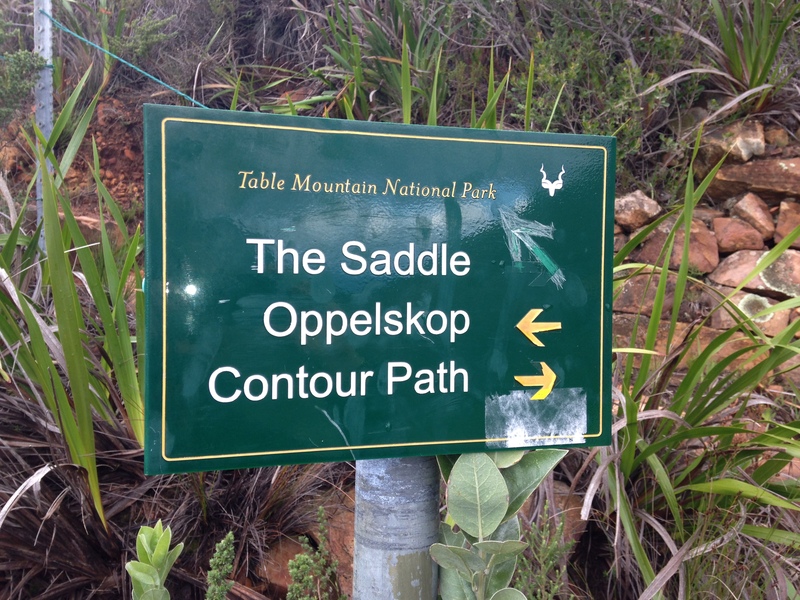 Heading left, we would follow the contour path before climbing up to Oppelskop. So many paths to choose from, but today we were taking it easy! 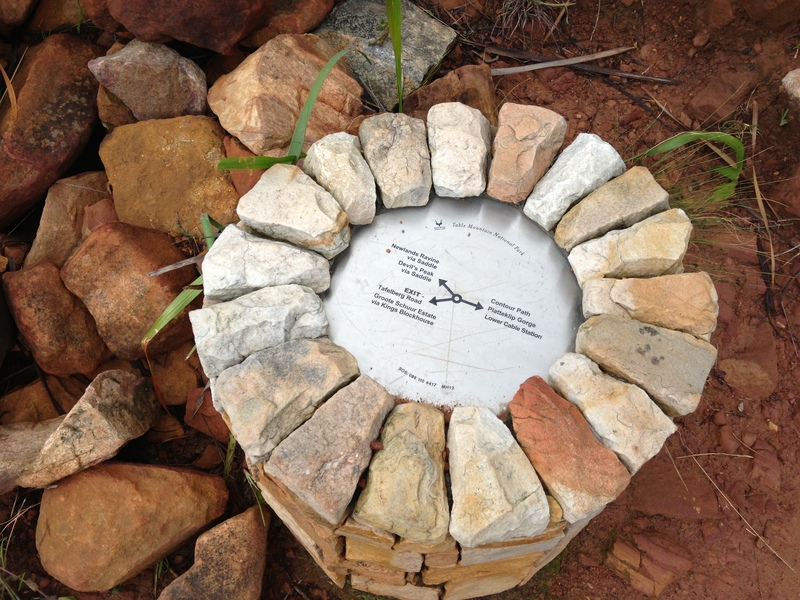 This was the first time I was doing this hike and from what I had read about it, it was due to start with a steep climb up. Although my head felt far from ready for this, I hoped my body would carry me and my 13kg backpack up the steep mountainside in front of us. 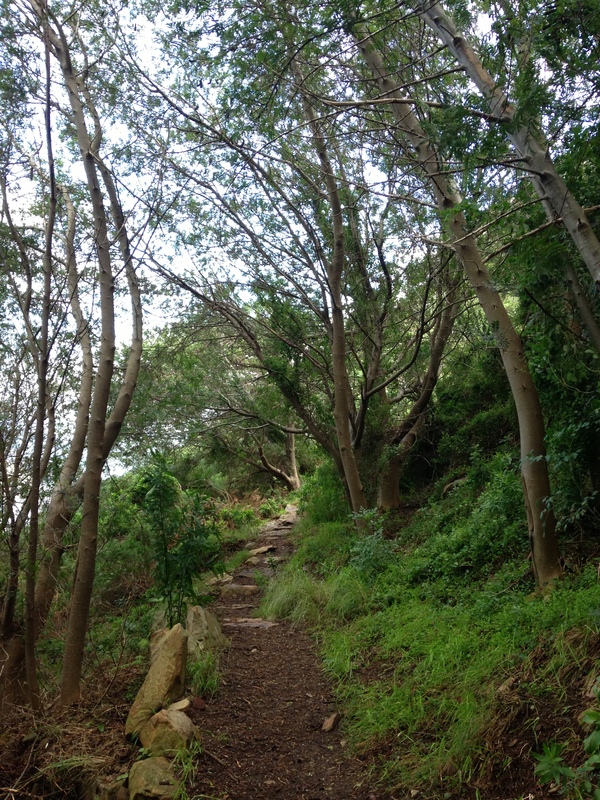 I was more than surprised when we started walking to find that I was coping well in my tender state and that the “steep climb up” was nothing more than a gentle, long incline with switch-backs thrown in every now and again to lessen the steepness. Maybe I am actually just fitter than I realise, even in my frailness, maybe those that wrote about the “steep climb up” were in fact less fit than me. 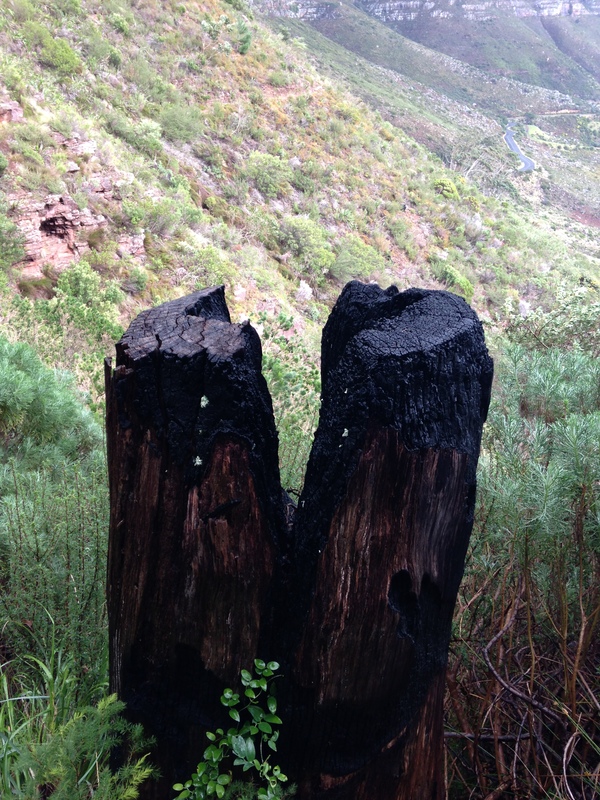 Needless to say, gratitude was abounding on the mountain that morning! 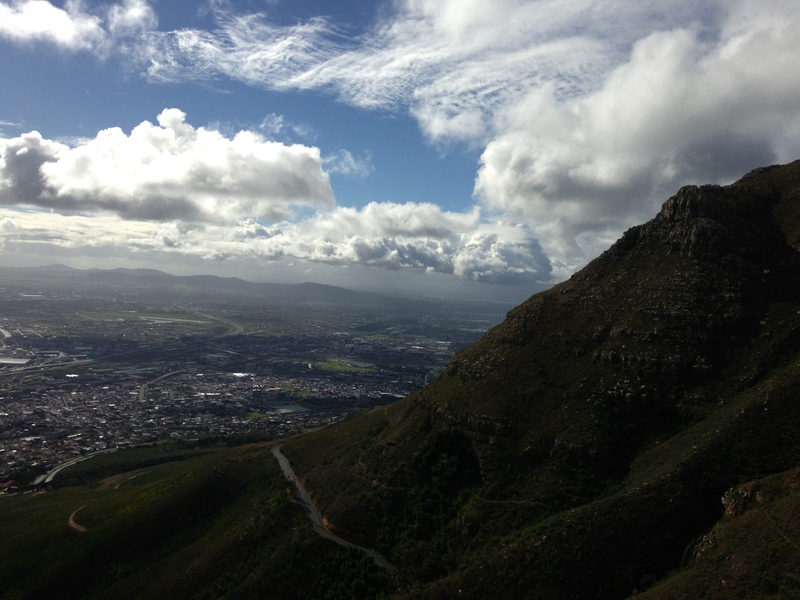 Although it was cloudy, threatening and cool, the weather was playing along nicely and it was a perfect day for hiking! We crossed many streams and waterfalls, all which added to the beauty of the mountain. 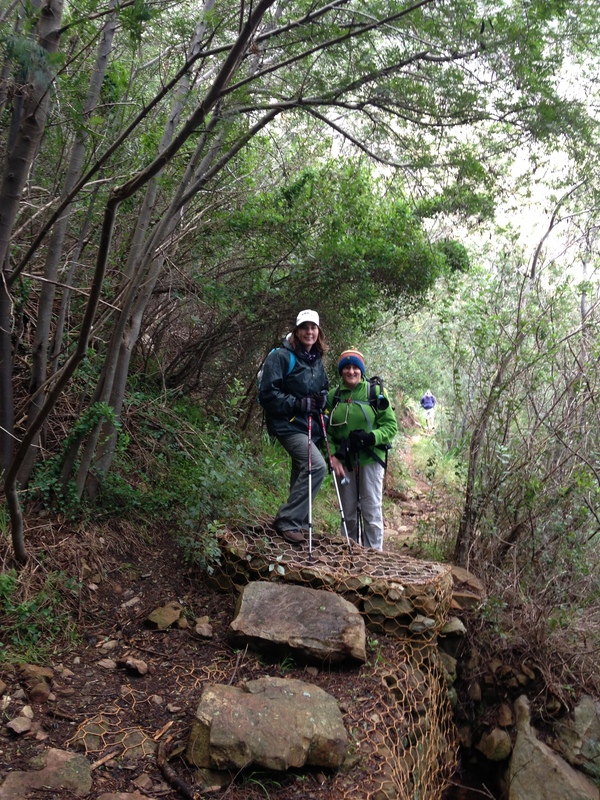 The contour path took us along the gorgeous green mountain slopes, under trees and through mini forests. 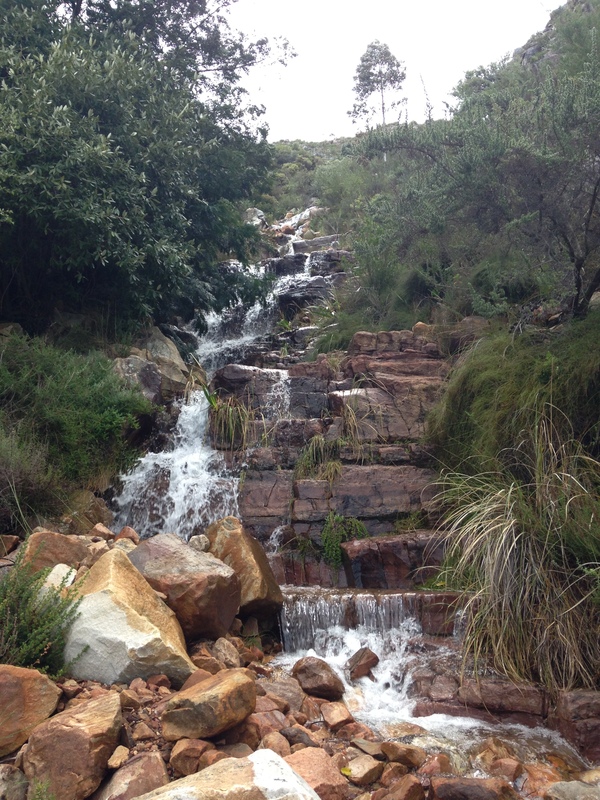 A beautiful waterfall crossing our path ~ one of the many beauties of hiking the mountain in winter. Two of my hiking companions with the other one coming up from behind. We knew the general direction in which we were headed and we knew which mini peak we were going to be climbing but we weren’t sure exactly where we would find the path up so as we walked and neared the peak we kept our eyes open for anything that might look like a pathway up. 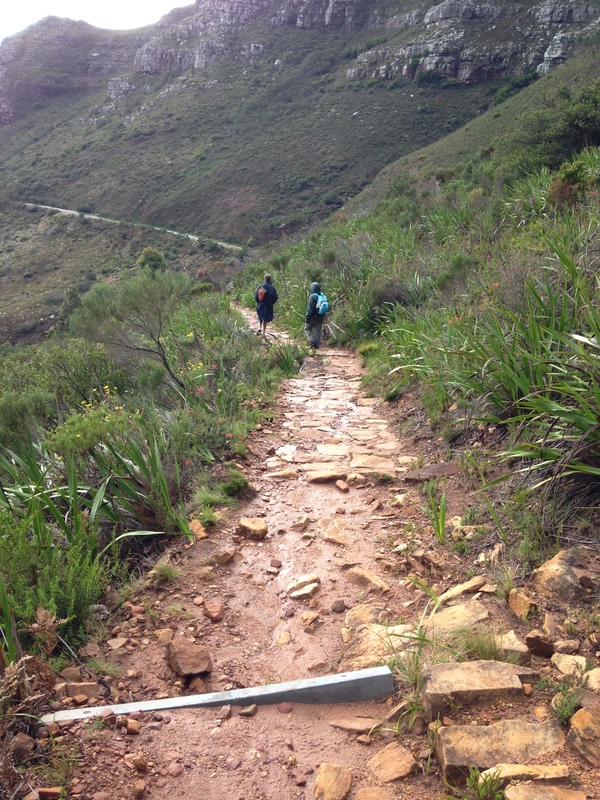 We came across one but it looked more like a mud slide from the recent rains than a path so we decided to keep going to see what was up ahead as we could always turn back if that was in fact our path up. A short while later we came across another path going up on the right, which looked more like a path up, however still unsure we decided to keep walking around the corner in front of us to see if any other options were up ahead. 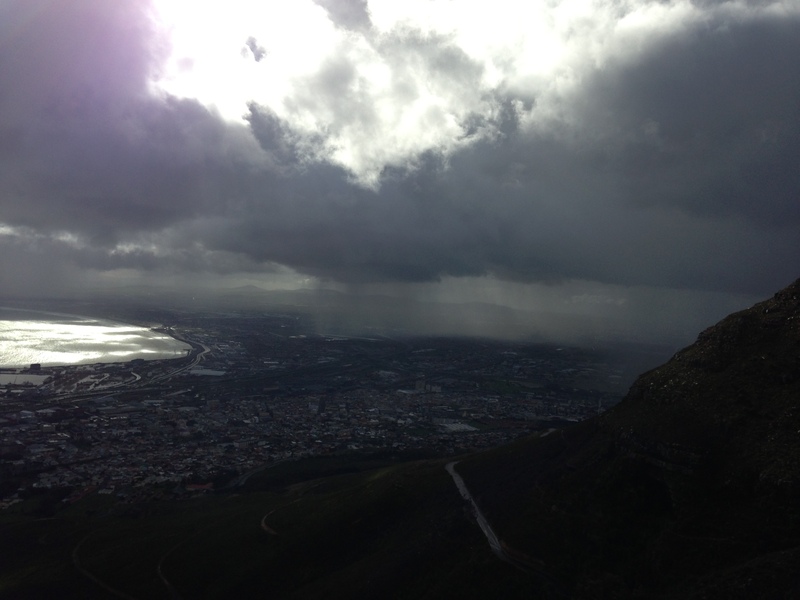 The views to our left of our city below were breathtakingly beautiful and although a cloudy day, the ocean was displaying patches of green and Robben Island was clear and large off in the distance. The rain clouds were threatening still and the wind would howl in various sections along the path, making us aware to watch our footing in the places where the path narrowed. Not finding any other suitable path to take us up, we headed back to find the last path we had found. As we reached the path up, we surveyed the ever threatening clouds and the sheet of driving rain that looked like it was heading directly for us! Ever threatening clouds and a sheet of rain heading straight for us. Although it was a bit of a climb ahead of us, we decided to stop and put on our jackets just in case the rain did in fact hit us. No sooner than we had zipped up our jackets, the sheet of rain hit us. Big, hard and very wet drops of rain! I looked up at my friend who was standing a little higher up the path already and the look on her face had me bursting out in uncontrollable laugher, my head thrown back and the rain drops hitting my face, laughing harder and harder! The look on her face was one of wetness and one that said “why the hell am I standing on this mountain right now? 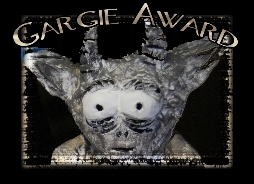 !” The more I looked at her the more I laughed and it wasn’t before long everyone was laughing with me but as the rain was by now really lashing down on us we decided to move up as quickly as we could in hope that somewhere higher up we could find a little bit of shelter from the rain. It is one thing to always hike in perfectly clear weather, but in truth you only discover the different moods and personalities of a mountain when you hike in less than perfect weather and anyway, it all just adds to the adventure. 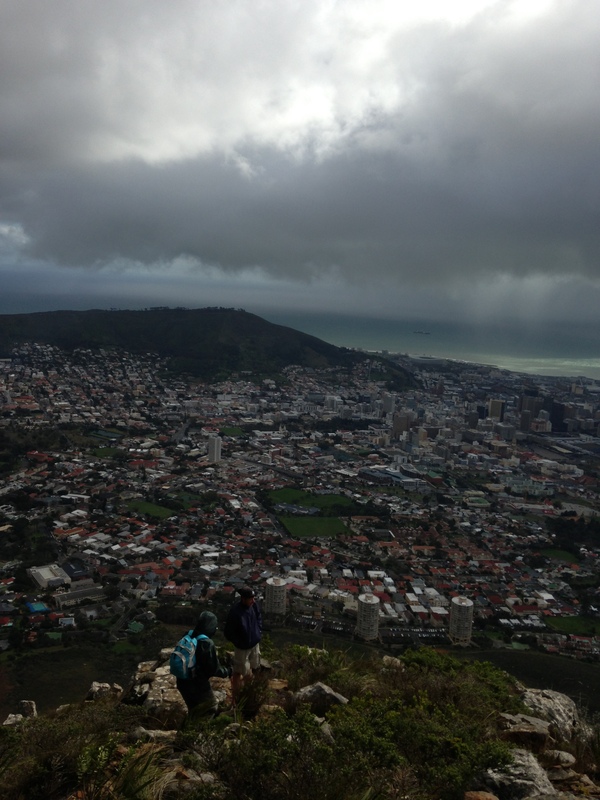 It was a little bit of a scramble up to the old look-out fort on the top, they said it was no more or worse than scrambling up to the top of Lions Head but in the rain, along with fingers that were wet and frozen to the bone, trying to get a good grip onto a rock to pull yourself up was close to agony! The driving rain not letting up, slamming into our bare faces and blinding the way as we scrambled up to the top but then just as we reached the top, the rain lightened and finally the clouds began to part. We were alone at the top and so had the options to pick a very sunny spot behind the fort wall that too acted as a wind-breaker. We lazed about on the top taking in the beautiful views and drying out everything that was wet and again I found myself grateful for quick drying pants! As the hike was short we took a nice long lazy break on the top, enjoy the bits of sun between the breaks in the cloud and for me, nursing my hangover. Reaching Oppelskop the clouds parted and the sun came out for a little while. 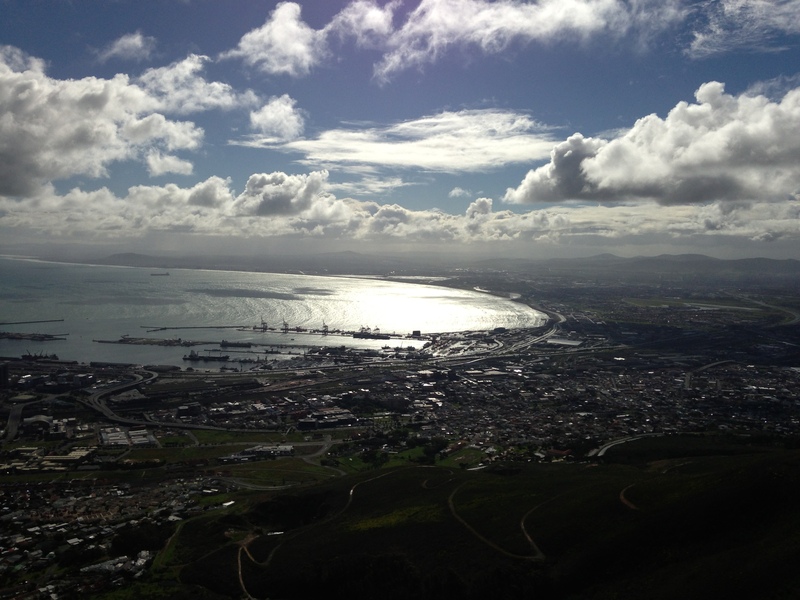 The views of our city below, as always, breathtakingly beautiful. 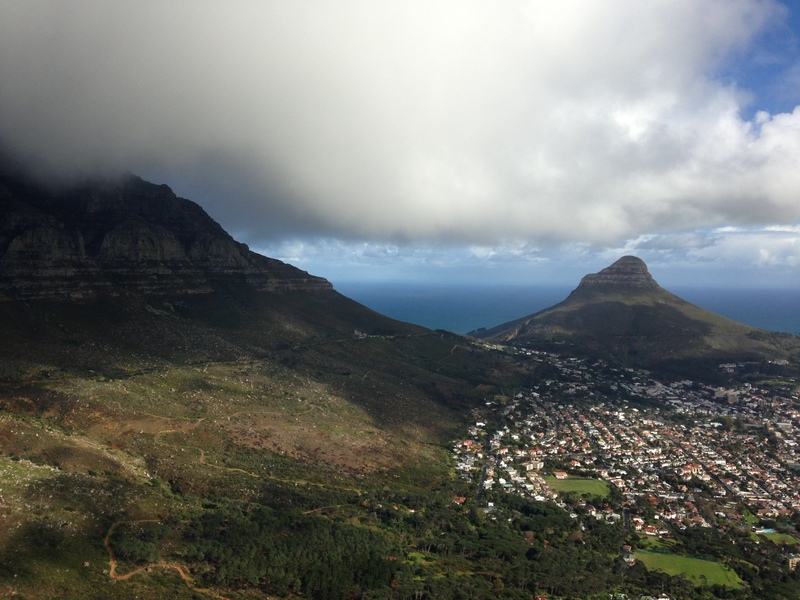 Beautiful views as the clouds parted showing off the front face of Table Mountain and Lions Head in the distance. Just part of the view before me as I perched myself again the old look-out wall, drying up and soaking up the sunshine. 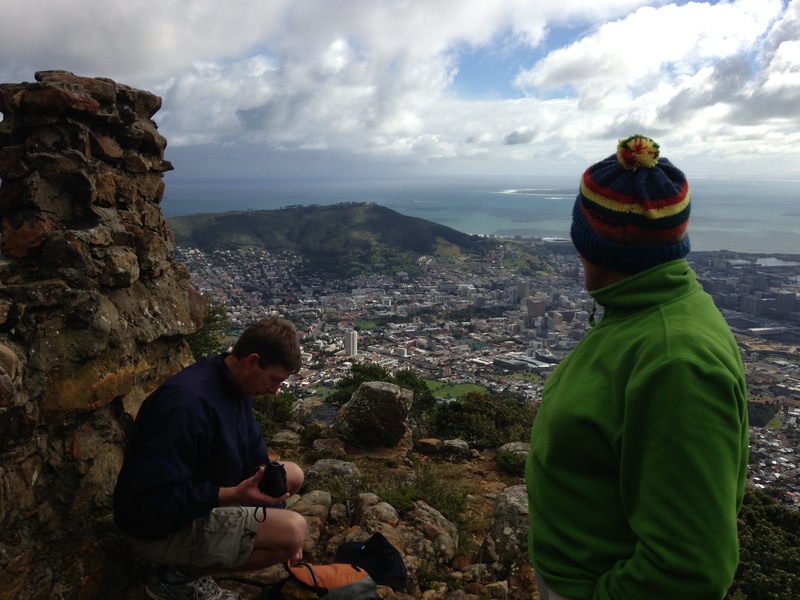 Taking in the view of the Mother City below. 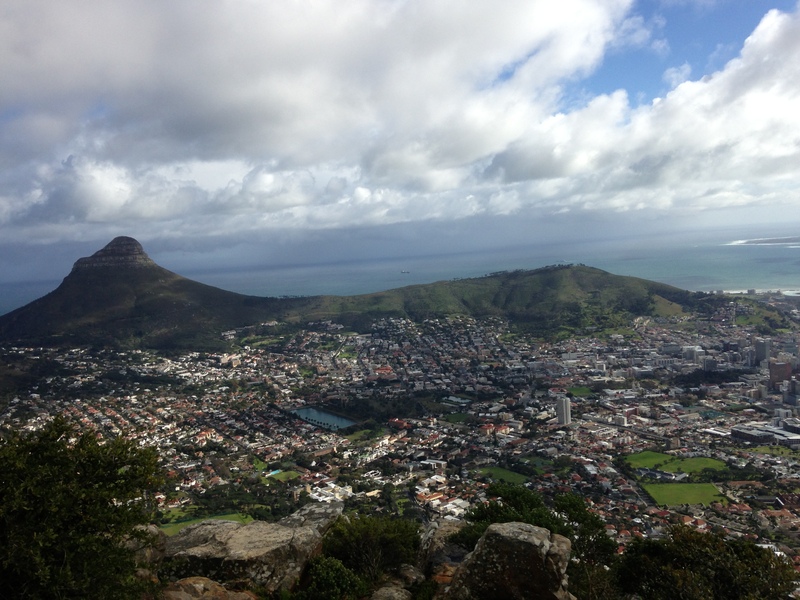 Views of Lions Head and Signal Hill. Scrambling back down the way we had come up was so much easier without the rain and the wet rocks. We enjoyed a nice leisurely walk back down through the greenery of the mountain, across the waterfalls and streams and finally back down the long gentle path, descending to the cars below. 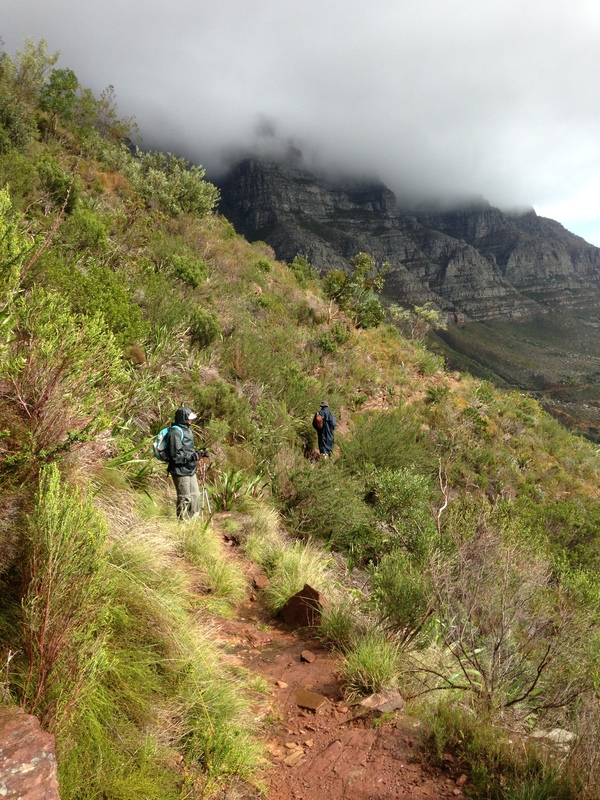 Making our way back down as the clouds darkened again and threatened us with more rain. Even on a dark, gloomy winters day, the mountain looks green and inviting. A cold wind and a few more drops of rain, yet nothing could dampen our spirits. The long, gentle descent back to the cars. 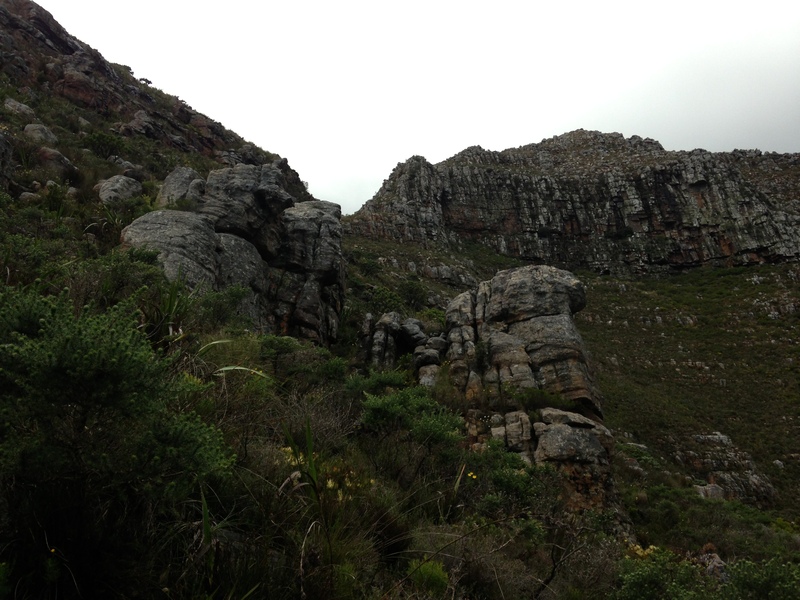 This had turned out to be the perfect, short hike filled with so much beauty that is Table Mountain. 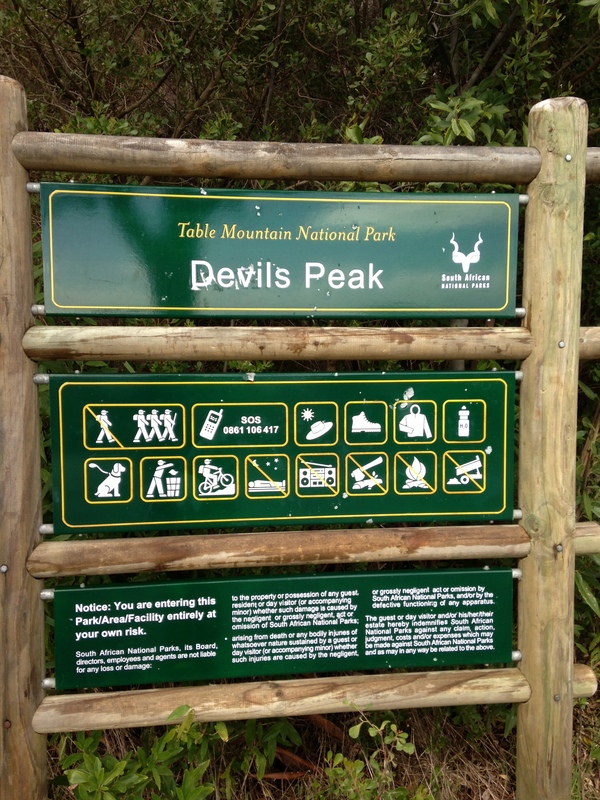 This hike offers many options to go and explore further and this is definitely one I will do again. Some may not like waking up early to go out in the cold and wet in winter but for me it’s soul restoring to go out into nature, whatever the weather, to feel the rain on your skin, to feel the sting of the icy wind and to drink in the magnificent views of this beautiful city I live in and all this with the amazing company of friends.